Fermented cherry tomatoes have became one of my favorite snacks. They are the perfect one bite treat. Blend them up with some fermented peppers and onion and you have a knock out salsa. Gather some of your favorite herbs, I used fresh thyme, and fresh basil. Dried would work too, use whatever you happen to like and have on hand. I also added a clove or two of garlic, and a bay leaf. First, let’s get the brine ready. I use a 5% brine, that’s approximately 3-1/4 tablespoons of salt (47g) per quart of water. I like to add the salt to about 1/4 cup of hot water in the measuring cup, stirring to dissolve, then I add cold water to the one quart mark. Poke the tomatoes with a fork, or the tip of a sharp knife, you want them to absorb all the brine and herbs. Smash and peel the garlic cloves. I keep them whole. Start layering in the tomatoes, and herbs. It’s important that the tomatoes stay submerged in the brine. I crosshatch a layer of sliced carrots on top of the tomatoes to help insure they will stay under the brine. Pour in the brine, then top that with a little condiment bowl. 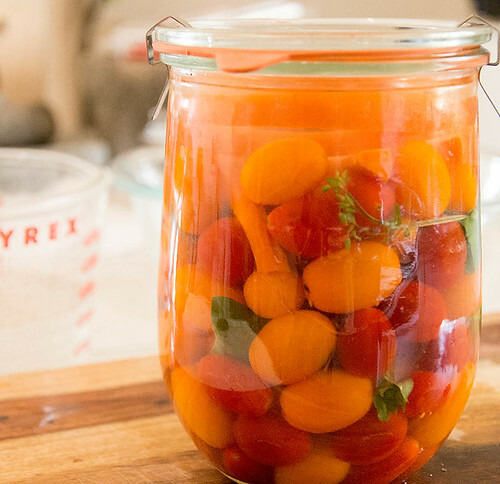 When the jar is lidded, the lid pushes down on the bowl, which pushes down on the carrots that keep the tomatoes under the brine. 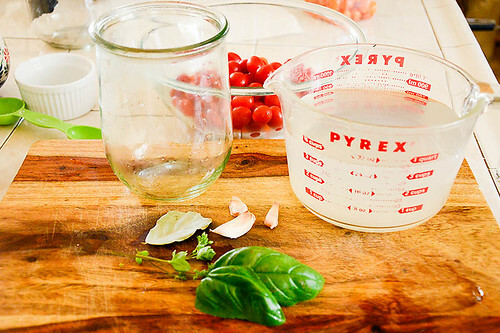 If needed, drain off some brine so it won’t overflow, just make sure the tomatoes are still covered with brine. Rather than a condiment bowl, you can layer on more carrots or even cabbage leaves. They will taste wonderful too. Place the jar in a bowl or on a plate. As the fermentation process progresses, gasses are released and sometimes the brine overflows. Place in a cool dark place for about 5 to 7 days. If you are using a canning jar and lid system, once it is filled, screw the ring down, then back off one quarter turn. It wouldn’t hurt to “burp” it every couple of days. I prefer using the clip type jars.